We have some tips on how to make your own Peter rabbit bedding as well as some nursery bedding collections that we would like to feature for those of you that have little time or the inclination for sewing crib quilts and fitted sheets. You can save quite a bit of cash by making your own set of bunny bedding from baby fabric using a free pattern or one that you buy used online. There are some very sweet prints available that have coordinating fabric panels that can be quilted and used as wall decorations. Many of which feature other popular patterns like argyle, plaid and stripes which can be coordinated with other prints. 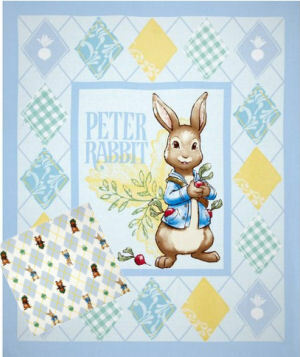 A crib quilt with a Peter Rabbit applique makes a very nice baby shower gift. 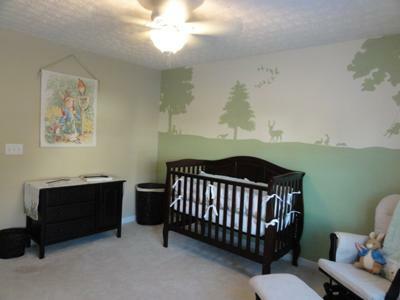 The mural in this room features silhouettes of many forest creatures in addition to a bunny, a squirrel and other animals and birds. The paint colors can be adjusted to complement any bunny themed bedding set that you choose for your baby boy's nursery. These fabrics would be perfect to make the baby bedding and the fabric panel can be used to make either a crib quilt or a wall hanging. 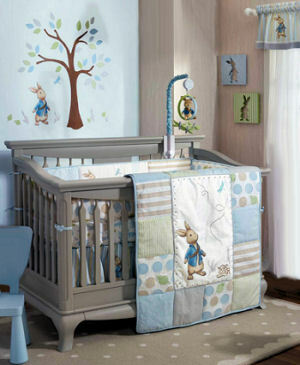 Do you have a great set of baby bedding or a picture of a nursery that you decorated in a Peter Rabbit theme? Share it! Whether you choose to buy or sew your own crib set is up to you. The key is to take your time choosing the fabrics as they will play a huge role in the room's decor. Many of the collections come with all of the accessories you will need from nursery window treatments to area rugs. Most parents find that this theme is very kind to their decorating budget as a Beatrix Potter or a Peter Rabbit nursery theme is an opportunity to get treasured collectibles out of storage and put them on display which eliminates the need to buy additional decorations. Please visit Unique Baby Gear Ideas often to see the latest in Peter Rabbit bedding and nursery decor.